Note to self: never make a puff pastry video on a hot day, in 90˚F weather, after drinking a whole bottle of champagne! Whoo-eee!!! Now that I've got that disclaimer out of the way, I can tell you about making puff pastry or Feuilletage with the fabulous blogger Tse of Chez Tse. We studied at cooking school together and later she joined me at Guy Savoy before interning at the famous patisserie, Pierre Hermé. Puff pastry is easy. It really is. And it tastes better and bakes lighter than store bought dough loaded with hydrogenated oils. The ingredients are simple: flour, water, salt, and butter. If possible use beurre sec or "dry" butter that has a low moisture content and high fat content . It will make the process easier and help keep the flour from turning into a greasy mess. But, just to prove that regular butter can be used, we've chosen normal unsalted beurre for our video. There are so many uses for puff pastry from easy fruit tarts to pastry shells for savory dishes. Make a big batch and freeze half! 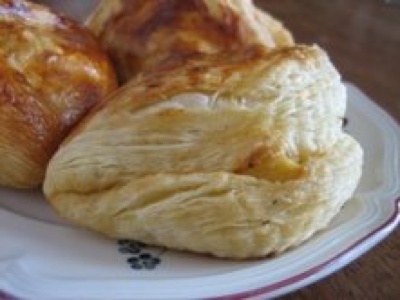 For recipe click on "continue reading How to Make Puff pastry...."
80g butter, melted and cooled to room temp. 2. In a bowl put flour and salt. 3. Pour over water and melted butter and mix quickly to form a ball. 4. Knead dough on marble or in bowl until it has a smooth surface. 5. Rest dough for 10 minutes in refrigerator covered with saran wrap before starting pastry turns. 6. Dust workspace with flour. Put dough ball on surface and make a cross with a slight lump in the middle by rolling out the edges. 7. Place butter in a square on top of mound and fold flaps over it like an envelope. 8. With a rolling pin, press down in an "X" on top of envelope. 9. Roll out dough carefully the length and width of the rolling pin. Fold in thirds. Turn dough towards you like a book. Repeat the process: roll out dough the length of rolling pin and fold in thirds. Cover with parchment paper and chill in refrigerator for 10 minutes. 10. Take dough out of fridge and repeat turns twice to complete the 3rd and 4th pastry turn. Chill again for 10 minutes. 11. Take dough out again and finish 5th and 6th pastry turn. Roll out 1/8" and cut to desired shape depending on the recipe. 1. 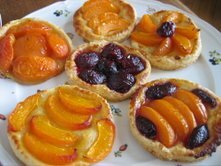 Fresh fruit tart: cut pastry to desired shape and brush with abricot jam and cut fresh apricots on top. Sprinkle some sugar on top (or don't) and bake until pastry is golden brown. 2. Apple turnovers. Cut pastry out into 3" circles. With rolling pin, roll center of circle so it becomes an oval (leave edges thick). Dices apples and flash fry in some butter and sugar with cinnamon and vanilla spice. (you can heat the sugar and butter together first to create a nice syrupy caramel before adding apples) Fill one half of pastry circle with a tablespoon of apples. Brush a little water on the half and fold the other over and press down to seal. brush with egg wash.
First of all, I LOVE dessert recipes! I'm totally saving this one to my favorites...it looks incredible. I'm putting this out to the universe: how to make tartes aux pommes. noticing your opening the apricot jam container -- quick trick: turn it upside down and bang the jar lid on the counter (not the edge of the lid, the flat surface of the lid). then you can twist open the jar easily (works with any jar). an old boyfriend taught me that trick and it works great (and i haven't broken a jar yet!). otherwise if you don't want to bang the jar on the counter or floor, you can use a piece of flat rubber (or rubber dish gloves) to open the jar. but i like whacking the jar. much more satisfying, and probably even fun for video purposes! by the way, you may want to look up sunday june 24's chronicle at sfgate.com. if you select the sunday magazine section, it has a little story on women chefs in the bay area (women vs men in their approach to restauranteuring, if that's a word). Chris – I'll have to remember that. I think this is the second video I've made where I couldn't get something open!!! Thanks for the SFgate article too. I'm always interested in female vs. male approach to cooking. Funny, when I was cooking in SF years ago over half of the restaurants had female head chefs (including the one I cooked at). But here in France it's such a rarity. Thanks to you and Tse for the entertaining video. Please invite Tse again. You keep on saying how easy it all is, maybe you can go the other route and admit that only real professionals like yourselves make it look easy. It is sort of like looking like an experienced tap dancer dance. Have you ever looked at a beginner tap? Not a pretty sight. Please keep on tapping. Another excellent video. I just don't understand why The Food Network hasn't swooped you up to do your own show. Tse looks different than I had imagined her from the picture on her blog. Need I say it? You're both gorgeous! Your video is great and you both look like you're having such a good time! I'm not sure I'll attempt it but if I ever do, you can be sure I'll be back to your video. what kind of flour are you using? is it baking flour (or self-rising)? Not as hard to find in the US as you might think - Plugra, Challenge European-Style, Land'O Lakes Ultra Creamy, Straus and Lurpak (Danish import) all have 82-85% butterfat. Available at a lot of "regular" grocery stores, and usually at Whole Foods, Trader Joe's and the like. Editor – Good question! We are using plain ol' All-Purpose flour. In France it is called type "55". I prefer type "65" but it's hard to find in the supermarkets. No need to use self rising flour this. The flour in France is different from the States, but I find for puff pastry, the normal American All-purpose works fine. It gets trickier when making croissants and yeast is involved. I know that the Cordon Bleu chefs when the are teaching abroad sometimes add a little vitamin C powder (ascorbic acid) to the flour. About 1/2 teaspoon/kilo. But, I don't think it's necessary. SAS – Thanks for the butter references. Gotta love Straus! Sui Mai – Let me know how it goes when you do try it!!! Bob – Gros Bisous! I would love to be on the cooking network. But I've kinda given up on these challenges. I just want to teach people technique! I am inspired to do this recipe this week...i bought some nectarines and apricot jam and everything, even a rollin' pin... but i don't really have a surface to work with... my kitchen counter is tile :(...lol... an good ideas? Maika – Oh la la la la – Tile!??! That's going to be difficult but not impossible. Make sure the tile is very dry and keep it dusted with flour. You could tape down parchment paper (papier cuisson) like we did in the video. We covered my dining room table with it so we had more room to roll out. I hope it goes well for you! Please let me know, I want to get feedback on the video – if it was really helpful or not. Hey there. I live in Turkey and there is no butter without salt in this country. So I had to use normal butter. ALso, my dough ripped as I was rolling it out but I tried making these patches by streching the dough onto the ripped parts. But I wonder if this will ruin my first attempt in making puff pastry. Will my pastry turn out bad? I have it in the fridge now, waiting to do my third turn. I am so self conscious about what I am doing. I am obviously going to have everything done in a mess by the time you give a response to my comments:) Maybe I will tell you how I went about doing it all tomorrow. And thanks for the video.I really enjoyed it. It also makes things so much easier. Dear Ms. Glaze, I had mighty trouble keeping my butter (regular - no dry butter here) inside the pastry - any thoughts, hints, tips? it felt like the pastry was always too thin on the bottom. it would be obvious if i had made a smaller batch of detrempe, but i used your measurements to a gram - was my butter maybe too soft? the dough kept sticking to the table despite regular flouring. Alino! Tse and I used regular French butter in the video but it can be trickier than dry butter. I like to use cold butter and Tse likes to use butter that's a more pliable but unless you have dry butter I think it's risky. It was an extremely hot day and she had some problems with hers because it kept melting so fast, but mine was fine. If the butter starts to show through on pastry turns it doesn't necessarily mean that all is lost. Pat some flour on top of it and carry on. What kind of flour were you using just out of curiousty!?! Also, if possible by sticks of butter that are flat and rectangular as opposed to the normal square bricks. I think it will make rolling out the dough easier. I am excited to try this recipe since I want to make an organic puff pastry. But since I am a little mathmatically challenged, do you have a way for me to make this dough using regular measuring cups/spoons. You're UTube is cute. Nice work and thanks for sharing. To Ms. Glaze re 'no unsalted butter" - make your own doll. Brilliant video. My first attempt is light, crisp and well risen (if not quite as puffed as Tze's! I was put off puff pastry years ago when I tried following a recipe book and ended up with hard, badly risen pastry. Since then, I've always used rough puff pastry - but this is much better. The video was really clear, though you probably need a bit of experience of making pastry to follow it easily. I used quite soft butter, as in my experience it is easier and quicker to use softish butter for all pastry, as long as you are deft and light-handed. I have just used a small amount of pastry to make an apple puff, and a rectangle with an added 'rim' filled with half a home-bottled pear, painted after cooking with apricot glaze. Both absoutely delicious. Thanks! I never thought I would make my own puff pastry. The video was not just helpful, but very well done. You not only made it LOOK simple, but made it simple. As I made it I was sure I was blowing it at every "turn," but it baked up good. Not perfect, but that's how it goes the first time, right? It's so much better than the store bought kind. You're going to make a lot of nurses very happy. How strong of a flour are you using? I used AP, but it occurred to me that french flour might be more akin to pastry flour, or somewhere in between. Will this work with Whole Wheat pastry flour? Is it that much harder to make it with regular american buttter? I love me some good butter, but it gets expensive! Lets do Croissants next! Oops, I just read the other comments, so you don't have to repeat all the answers, but i'm still currious about whole wheat pastry flour. Anyway, thanks again! i am from indonesia. i love eat puff pastry. if i wants to eat pastry should buys in hotel bakery and very ekspensive. i never thought i can make it. Thanks a lot for this! I followed your recipe and easy to follow video and made it right the first time! I also posted a link to your blog from my blog. Thanks for sharing! I ran across your video awhile ago while on a quest to make puff pastry. I did not go well. And after seeing your video it just looks so damned easy that I figured why not just pretend that it's the easiest thing in the world to make and see what happens? My previous attempts were when it was 95 degrees outside, so luckily I had a cold day, opened the kitchen windows, and used Julia Child's flour measurements and proportions quickly and simply. Tossed in a bit of citric acid, and actually started the whole thing off in the food processor. I rolled it out on waxed paper sheets I had taped to the counter top, and went to town. Piece of cake, and aside from taking, obviously, a bit of time, it actually WAS one of the simplest things I've ever done. So from now on maybe I'll say, Piece of puff pastry. It was easy to handle, baked up perfectly and was one of the most delicious things I've ever tasted. Am looking forward to some dinner parties where it's in the mix. Thanks for the video, it helps to remember that when in doubt practice makes perfect and advice from the masters helps the practice go much, much better! Found your video today after looking for answers on making puff pastry. I have made two batches so far and I think my next one will work out even better thanks to your video! I had been following Julia Child's instructions but sometimes things are so much easier to understand by seeing it done! Thanks! Hi Ms Glaze. Your video is very funny. At college we use strong bread flour because it stretches better. I could never get my head round the turning but it's amazing how two attractive women make one concentrate more so now I realise what to do. Are you using President butter? Do you sometimes mix the butter with flour and knead it before wrapping it? It's our college technique. Thank you sooo much for the video. i've seen one recipe with vinegar tho. Im wondering what would be the effects of vinegar in a puff pastry and if it is necessary? Maybe your video is interesting but it does not show you making feuilletage,for feuilletage should have equal amounts of butter to the flour. Your recipe has 400 grms of flour to 340grms of butter. Gallette has 400grms of flour to 300grms of butter. Someone asked about vinegar in the making of puff pastry. Vinegar (acetic acid) like Lemon juice (citric acid) can be used to acidulate the gluten in the flour. I was shown, years ago in training to become and chef/hotelier, that half a squeezed lemon will do this and help the soft pliability of the dough before rolling in the butter. I have proved that this make much difference myself, so it may be something to do with how acid, or alkaline, your water is. Hard calcified water (which is always alkaline) is not good for this task, and soft acid water is much preferred. Soft clean rain water, reverse osmosis water (R.O) or, simpler, bottled spring water would all work well. David, French ingredients are different than American ones and dry butter has an extremely high fat content. Much more than regular butter. Acid is often added to puff pastry dough that has yeast, but for regular puff it's not necessary. French water and flour and butter are different than American counterparts. i've even added crushed vitamin C to American flour to give it more of a French feel. i've made some puff pastry and my problem is that although it puffs up it also shrinks by a few inches by the sides. is it normal or is there a way for me to limit if not eliminate shrinkage? can I use this pastry in a chicken pot pie recipe? i second the disappointment. The video was very helpful.